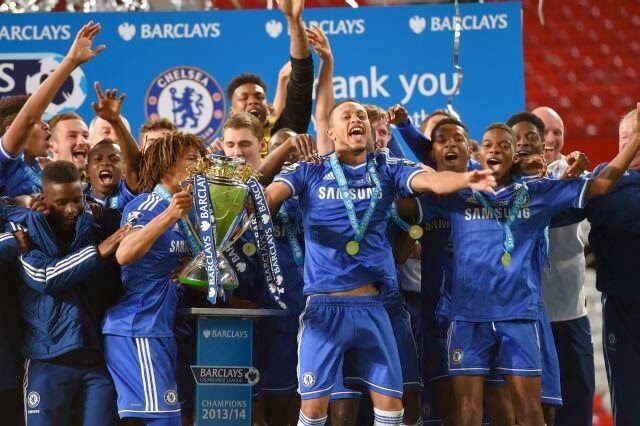 The Chelsea Football Club season finally came to an end last night when the U21's side aimed to win the academies second trophy of the season when they took on Manchester United at Old Trafford in the U21's Play Off final. For those unfamiliar with the league set up, at the end of the season the teams that finish in the top four play off to determine the overall winner, first plays fourth and second plays third winners of both games go into the final. As Chelsea finished top of the league they had home advantage for both the semi final and the final but due to European commitments and the fact that the pitch was being pulled up at Stamford Bridge meant that Chelsea gave up that home advantage in both games. Chelsea have had a reasonably settled side all season with many of the team out last night playing in the majority of the league games this season. Jamal Blackman returned in goal behind a back four of Isaak Ssewankambo at right back, Andreas Christensen was partnered by Ola Aina moving inside from his usual right or left back slot and Adam Nditi occupied the left back role. In midfield was a base of two of Nathan Ake and Ruben Loftus-Cheek with and attacking midfield three of Lewis Baker behind the forward and John Swift and Charly Musonda in the wide roles and Islam Feruz leading the line. It was a team set up almost perfectly, a very strong defence with a solid midfield line ahead of Ake and Loftus-Cheek to allow the attacking players the freedom to do what they do and for the majority of the game it was Chelsea that would control proceedings. There was good early pressure from Chelsea and Lewis Baker had a couple of good early chances to take the lead for Chelsea particularly when he drove forward in the space in front of him with the United defenders backing off he was able to get a shot away which was going in but was smartly saved by the united keeper. Things then took a huge turn as United broke down the left hand side after Adam Nditi gave the ball away and then just in and missed a challenge which left the United winger in space to break forward, it was something that was a feature of the opening period of the first half and the ball got played into the box which was touched off nicely by the forward Wilson to Lawrence who faked a shot leaving both Ake and Aina on their backsides and then he smartly curled it into the far corner to give United a lead on the night and Chelsea a lot of work to do. After that Chelsea had to take control of the game and they did. All the chances on goal now were Chelsea's and whilst United were dangerous on the break the team did enough to ensure that there was no real chances on the Chelsea goal and United were doing equally well at restricting the real chances on goal. But Chelsea would get the equaliser before the teams went in for the break. Nathan Ake found Charly Musonda making a run infield from the left of the pitch he ran in between and past two United players and drove towards goal, then jinked across another player before hitting the ball back across goal catching the keeper cold and putting the ball into the bottom left hand corner. It was a deserved goal for the boys who had been working hard to restrict United and try to open up the United back four. Now Chelsea were in the ascendancy and as United had to come forward again were trying to exploit the openings left behind, on one occasion Charly Musonda was found wide left completely unmarked and able to put a very good ball across the box toward Islam Feruz who dummied the ball and it rolled to Swift who brought it under control and shot at goal, given his scoring form this season you expected him to at least hit the target but his curling effort went wide of the post. The second half started in the same way as the first finished with Chelsea controlling proceedings and pushing to get the goal that would put them in the lead. The football Chelsea was playing was becoming very confident and the inter play between Baker, Swift and Loftus-Cheek in particular was very good. It was that trio that worked the next Chelsea opening. Quick passing between Baker and Swift and Swift saw a good charging run forward by Loftus-Cheek who with Feruz running in at the far post had the vision to be able to spot Baker running in with space and cut it back to him, in that situation you would be your house on Baker putting it away but he got hold of it too much and blasted it over the bar. It was a big miss that Chelsea and Baker were hoping would not come back to haunt them. It was pretty much all Chelsea at that point and it looked like it would be a matter of time before the goal would come. The next big chance would fall to Loftus-Cheek, good hold up play out on the right hand side by Islam Feruz who was again having a very tough time of things on the night saw the run of Luftus-Cheek on the edge of the box and the pass found him, Loftus-Cheek then powered into the box past two defenders but his angle had been narrowed down and his shot although on target was easy for the keeper to get away with his feet. There would be a few more chances for Chelsea, none of which as clear cut and none taken but there was a chance for Man United to take the lead when Kasey Palmer who had just came on tried too much in the midfield and lost the ball which saw the United midfielder Pearson run into the box and for the first time get away from Ola Aina enough to get a shot on target but the shot was not strong enough and it went straight at Blackman who gathered up and not long after that the breakthrough game with about 10 minutes to go. Good pressing from Baker by the touchline blocked an attempted clearance and the ball popped up in the air, trying to bring the ball down the United defender miss controlled the ball and it rolled to Feruz who touched it forward and it was taken up by Baker running across goal who hit a perfect shot on the move right into the far right corner and finally Chelsea got the lead that they had been pushing for. It was a very tidy finish in a pressurized moment in the game, just when you expect Baker to deliver the goods and he did. Now Chelsea had a lead to defend and they had to hold on for the remaining minutes of the game. United were throwing everything at Chelsea but the team were holding out stoutly but with minutes to go a chance came for the home side. Not being able to break through the blue wall United had to resort to trying anything and it nearly paid off when an innocuous clearance was floated out and the substitute Blackett hit the ball on the volley 25 yards out and it was well hit and on target but Blackman was equal to it and dived across to save it and eventually Chelsea held to win the game 2 - 1. It was a deserved win given the season that the team had and the performance on the night was as impressive as they had been all season. That mean two trophies for the season the FA Youth Cup and the U21 League. It would not have been undeserved if the U21's cup and the UEFA Youth League had been won also as they had looked totally dominant but somehow managed to lose games in those competitions. A very impressive league season ended in the trophy and now Chelsea will have to defend it next year. It was another incredible game with wonderful football and a great advert for U21's and academy football in general.